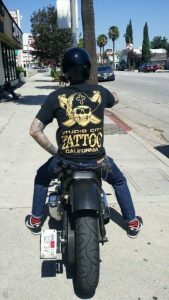 Studio City Tattoo is an award winning tattoo shop that has won many awards throughout the years, and through the years, we’ve had some very talented tattoo artists on our crew. Every day our team strives to get better and better, and it shows. Just take a look at our tattoo and body piercing pictures or browse through our 5-star reviews rating on YELP. We’re proud to be the home of a talented crew so stop in and see why so many discerning customers have brought us their business since 1992. We’ve been voted the #1 tattoo & body piercing shop in Los Angeles County multiple years by the Best Of Los Angeles Hot List, Citysearch, and Fox LA. Our artists are frequently chosen for LA’s top ten by various magazine though out the years.Studio City Tattoo is also the winner of the Studio City Chamber of Commerce Small Business Award 2014 and United Chamber of Commerce Small Business Award 2014. Studio City Tattoo got started in 1992, and created its first website studiocitytattoo.com in 1999. Since 1992, Studio City Tattoo has significantly made big changes over the years leading the industry in safe and sterile procedures, going above and beyond standard safety protocol. For new clients, here are a few things we are sure you would like to know. Besides the beautiful, unique tattoos and well-executed piercings, Studio City Tattoo® is known for being a friendly, fun, safe and honest shop. We care about each and every tattoo and piercing that we provide and only using and selling the highest quality body jewelry available. Most shops talk a good game, but our results prove our excellence. If you don’t look good, we don’t look good! We designed the facility with the intent of giving our customers an entertaining environment to enjoy while receiving their services. We wanted to get away from the stereotypical cookie –cutter shops of the time. Inspired by the freewheeling adventurous lifestyles of the Buccaneers of old, our shop is decorated to reflect the Golden Age of Piracy. The shop’s decorated with a collection of swords, flintlocks, and piratical decor. Immerse yourself in our world for a little while. Your friends will not be bored while they wait; there is always something to look at. Browse through our treasure chests of trinkets, semi-precious jewels mounted in silver and our new premiere Lux collection of body jewelry.We carry the likes of BVLA, Anatometal, Diablo Organics Tawapa and more.We truly do have something for everyone. Small Business Award 2014 and United Chamber of Commerce Small Business Award 2014.
and United Chamber of Commerce Small Business Award 2014.